In the first six months of 2018, the profits made by industrial enterprises above the designated size achieved 3,388.21 billion yuan, a year-on-year increase of 17.2 percent, and the growth rate increased by 0.7 percentage points from the first five months. In the first six months, the profits of state-holding industrial enterprises above the designated size gained 1,024.87 billion yuan, an increase of 31.5 percent year-on-year; that of collective-owned enterprises reached 10.97 billion yuan, an increase of 4.6 percent; that of joint-stock enterprises stood at 2，405.99 billion yuan, up by 21.0 percent; that of foreign funded enterprises, and enterprises funded from Hong Kong, Macao and Taiwan achieved 819.76 billion yuan, increased by 8.7 percent; and that of private enterprises gained 888.91 billion yuan, an increase of 10.0 percent. In the first six months, the profits of mining and quarrying reached 285.39 billion yuan, an increase of 47.9 percent year-on-year; that of manufacturing was 2,880.05 billion yuan, an increase of 14.3 percent; that of production and distribution of electricity, heat, gas and water reached 222.77 billion yuan, up by 25.3 percent. In the first six months, within 41 branches of industrial divisions, the industrial profits of 29 industrial divisions increased year-on-year, that of 1 remained at the same level, and that of 11 decreased. In view of the profit growth of major industries, the profits of mining and washing of coal increased by 18.4 percent year-on-year, that of extraction of petroleum and natural gas increased by 3.1 times, that of processing of food from agricultural products increased by 2.2 percent, that of processing of petroleum, coal and other fuels increased by 34.3 percent, that of manufacture of chemical raw material and chemical products increased by 29.4 percent, that of manufacture of non-metallic mineral products increased by 44.1 percent, that of manufacture and processing of ferrous metals increased by 1.1 times, that of manufacture of general-purpose machinery up by 7.3 percent, that of manufacture of special-purpose machinery up by 19.4 percent, that of manufacture of motor vehicles increased by 4.9 percent, that of manufacture of electrical machinery and equipment increased by 2.3 percent, that of production and supply of electric power and heat power up by 27.4 percent, that of manufacture of textile down by 1.1 percent, that of manufacture and processing of non-ferrous metals decreased by 8.3 percent. that of manufacture of computer, communication equipment and other electronic equipment decreased by 2.3 percent. In the first six months, the revenue from principal activities of industrial enterprises above the designated size reached 52.1 trillion yuan, increased by 9.9 percent year-on-year. The costs of principal activities were 44.0 trillion yuan, up by 9.5 percent. 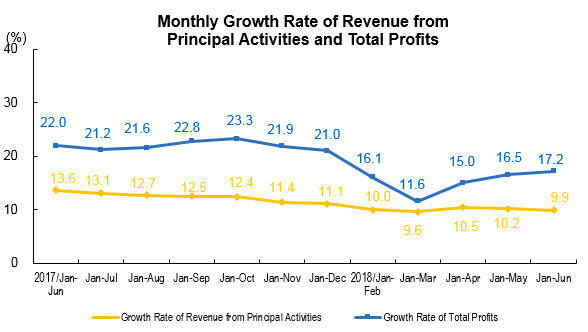 The profit rate of revenue from principal activities was 6.51 percent, an increase of 0.41 percentage points year-on-year. By the end of June, the total assets of industrial enterprises above the designated size was 109.4 trillion yuan, increased by 7.4 percent year-on-year; the total liabilities reached 61.9 trillion yuan, increased by 6.6 percent; the total owners' equity was 47.5 trillion yuan, increased by 8.6 percent. The asset-liability ratio was 56.6 percent, a decrease of 0.4 percentage points year-on-year. By the end of June, the total volume of receivable accounts for industrial enterprises above designated hit 13.7 trillion yuan, went up by 11.7 percent year-on-year. The total value of finished products for industrial enterprises accounted for 4,118.76 billion yuan, increased by 8.3 percent. 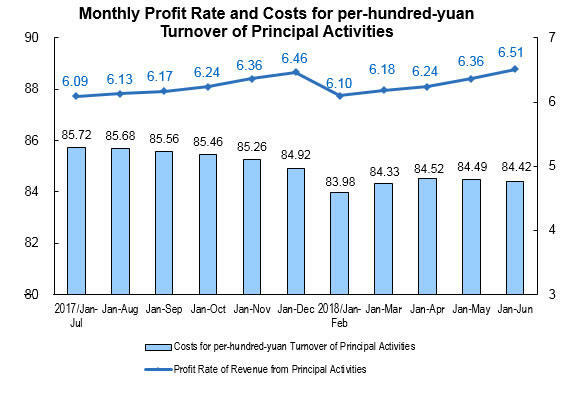 In the first six months, the costs for per-hundred-yuan turnover of principal activities stood at 84.42 yuan, a decrease of 0.37 yuan year-on-year; the expenses for per-hundred-yuan turnover of principal activities stood at 8.15 yuan, a decrease of 0.03 yuan; the revenue from principal activities brought by per hundred yuan assets was 96.8 yuan, an increase of 2.2 yuan; the revenue from principal activities per capita was 1280 thousand yuan, an increase of 142.0 thousand yuan; the turnover days of finished goods were 16.4 days, a decrease of 0.1 day; the days sales outstanding hit an average of 45.5 days, an increase of 0.4 days. In June, the profits made by industrial enterprises above the designated size achieved 658.29 billion yuan, a year-on-year increase of 20.0 percent, and the growth rate decreased by 1.1 percentage points from May. Note : Due to the overlap of economic type grouping, the total is not equal to the total of sub-items. Note : Mining and Support Service Activities had a loss of 0.63 billion yuan in the same period of last year. 1. Total Profits: refer to the surplus of various revenue deducting various costs in the production process of enterprises, reflecting the total profit and loss in the report period. 2. Operating income: refers to the total amount of revenue of enterprises recognized by the principal business and other business operations. 3. Revenue from Principal Activities: refers to the total amount of revenue of enterprises gained from the principal business operation. 4. Operating costs: refers to the total costs of enterprises incurred by the principal business and other business operations. 5. Costs of Principal Activities: refers to the total costs of enterprises incurred by the principal business operation. 6. Total Assets: refers to the resources which are gotten from past transactions or events, owned or controlled by enterprises, and expected to bring economic benefits to the enterprises. 7. Total Liabilities: refers to the current obligation generated from past transactions or events, and expected an outflow of economic benefits from the enterprises. 8. Total Owners' Equity: refers to the residual interests after deducting liabilities, which belongs to the enterprises owners. 9. Accounts Receivable: refers to the creditor's rights due to the sale of goods, services, and other business activities, including the payment for goods, value-added tax, prepay freight and miscellaneous charges, to be collected from the customers. 10. Finished Goods: refers to manufactured products which are ready for sale by the end of report period. 11. Profit Rate of Revenue from Principal Activities = total profits / revenue from principal activities × 100%, unit: %. 12. Costs for per-hundred-yuan Turnover of Principal Activities = the costs of revenue from principal activities / the revenue from principal activities ×100, unit: yuan. 13. Expenses for per-hundred-yuan Turnover of Principal Activities = (selling expenses + administrative expenses + financial expenses) / the revenue from principal activities ×100, unit: yuan. 14. Revenue from Principal Activities Brought by per Hundred yuan Assets = the revenue from principal activities / average assets / the cumulative number of months × 12 × 100, unit: yuan. 15. Revenue from Principal Activities per Capita = revenue from principal activities / average number of employment / the cumulative number of months × 12, unit: 10 thousand yuan/ person. 16. Asset-Liability Ratio = total liabilities / total assets × 100%, unit: %. 17. Turnover Days of Finished Goods = 360 × average finished goods / costs of principal activities × the cumulative number of months / 12, unit: days. 18. Days Sales Outstanding (the number of days on average a company takes to collect its accounts receivable) = 360 ×average accounts receivable / revenue from principal activities ×the cumulative number of months / 12, unit: days. 19. In the columns of increase rate year-on-year of the three tables above, the “note” refers to negative total profits in the same period last year, which means loss; the positive value refers to a year-on-year increase of profits; the negative value which is greater than or equal to -100% refers to a year-on-year decrease of profits; the value less than -100% indicates turning gain in the same period last year into loss in current period; and the value of 0 indicates that the profits remain at the same level year-on-year. II. 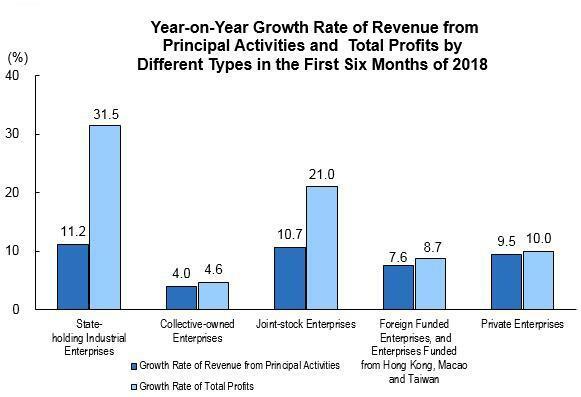 The growth rates of the total profits and revenue from principal activities of industrial enterprises above designated size are calculated on a comparable basis. There are incomparable factors between the data in the reporting period and the same indicator data published in the previous year, which cannot be directly compared to calculate the growth rate. The main reasons are: (1) According to the statistical system, the survay coverage of industrial enterprises above designated size is adjusted regularly every year. Each year, some companies will be included in the survey after having reached designated size, and some will exit the survey due to their smaller size, and there are also influence of new built and starting enterprises, bankruptcies, and companies that have been suspended or sold. (2) By strengthening the statistical law enforcement, the enterprises found in the statistical law enforcement inspection that do not meet the industrial statistics requirements above designated size have been cleared, and relevant bases have been revised in accordance with regulations. (3) Strengthen data quality management and eliminate the cross-regional and cross-industry repeated calculation. According to the latest investigation of the organizational structure carried out by the National Bureau of Statistics, since the fourth quarter of last year, the cross-regional and cross-industry repeated calculation of enterprise groups (companies) has been eliminated. (4) After the implementation of the “reform of replacing business tax with value-added tax” policy, the service industry enterprises turned to pay value-added tax of which the tax rate was lower. The industrial enterprises have gradually divested their internal non-industrial production and operation activities, and turned to the service industry, which had diminished the financial data of industrial enterprises. Industrial enterprises above the designated size, which refer to industrial enterprises with revenue from principal activities over 20 million yuan. The Financial Report of Enterprises Above the Designated Size conducts complete survey by month (the data on January are not required to report). The Industrial Classification for National Economic Activities (GB/T4754-2017) was implemented, please refer to http://www.stats.gov.cn/tjsj/tjbz/hyflbz.